Our challenge this month was to use sequins, which is becoming the latest and greatest trend. I didn't know if I would like using sequins, but THEN I saw the packages at the fabric store. Sequins in every color. OH MY! I fell in love which brings us to today's card. I used one of the Half & Half dies for my stamped focal image. It is such a great die set because it is easy to mat, which I love. The sentiment is also from PaperTrey Ink - one of my favorite companies!! Thanks again for stopping by. Don't forget, you can play along too. Just create a card using sequins and link it up right here. I can't wait to see all the sparkles! I like your combination of gingham and polka dots npapers. The sequins really direct your eye to the sentiment. Nicely done!! What a cool way to accent with sequins! Love the monochromatic idea, very nice! Love the monochromatic color scheme!! What a fun way to use the sequins by making an arrow! Very pretty! Cool way to use the sequins! Cute card! Nice accenting of your sentiment! love the simlpe two color card, great! What a cool way to incorporate the sequins! Pretty card! 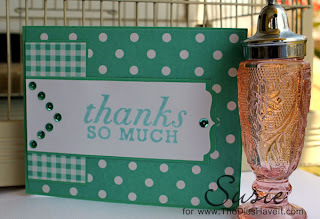 Love the way the sequins pull your eye across the sentiment panel - great card! Susie, what a pretty card! I love the design & color. Love your card Susie! I need to remember to use the half and half die to matt a sentiment like this. Your sequins really add a nice bling! Great use of the sequins in accenting your sentiment.